Primo George Quarisa passed away February 11th in Reno, NV; he was born June 17th 1930. He joined the US Navy in 1950 and volunteered for submarine duty during the Korean Confict, attended submarine diesel engine school, was stationed on the USS Aspro and earned Engineman Third Class (E-4). Following his military sdrvice, Primo started his forty year career as a diesel mechanic. His greatest honor came when he was nominated by the US Submarine Veterans of America to be on one of the first Honor Flight Nevada’s trips to Washington, DC. It was rare to not see Primo in the front row reception waving an American Flag at every returning Honor Flight Nevada or on the US Submarine Veterans’ float in the Independence Day and Nevada Day parades. There will be an interment service with Military Honors at the Northern Nevada Veterans’ Memorial Cemetery. 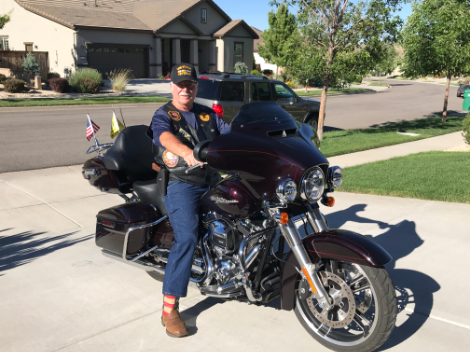 I am Honored to be the Ride Captain for this fallen Veteran. and hope the verse comforts your family.